Have you ever looked at the seemingly random numbers scribbled on a piece of paper that you sometimes get at the optometrists? If you are more familiar talking in terms of hundreds of degrees of short or longsightedness, how come there are all these + and - signs and then all the decimals? And then there is the funny fraction at the end, which may say 6/6 in most parts of the world (or 20/20 in the US) for good vision. 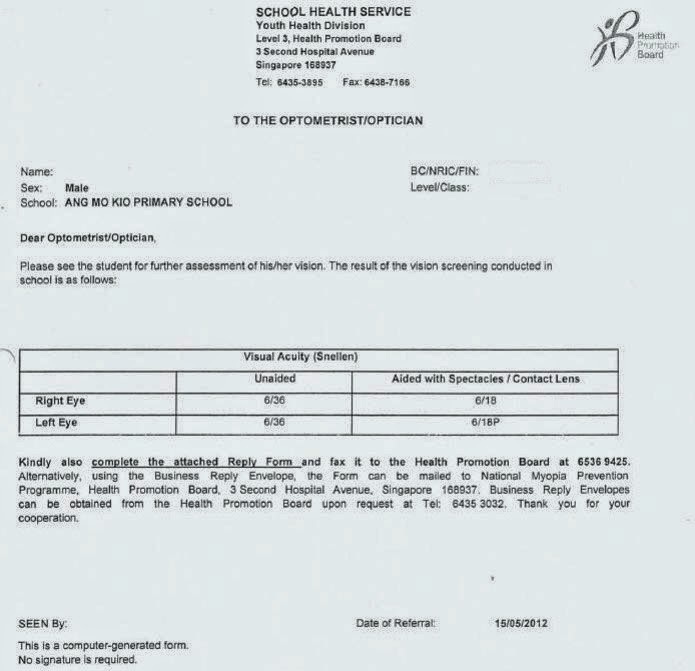 Singapore parents with school going children may remember seeing the note below, as all primary school children undergo vision screening once a year and if vision is less than adequate will be referred to refraction clinics or optometrists. Oh no! Vision not great on the screening test and it's time to go to the optometrist's again! Let's take a step back, and look at what your optometrist is trying to do. Basically, the aim is to get the best vision possible using spectacle lenses which bend/focus light. 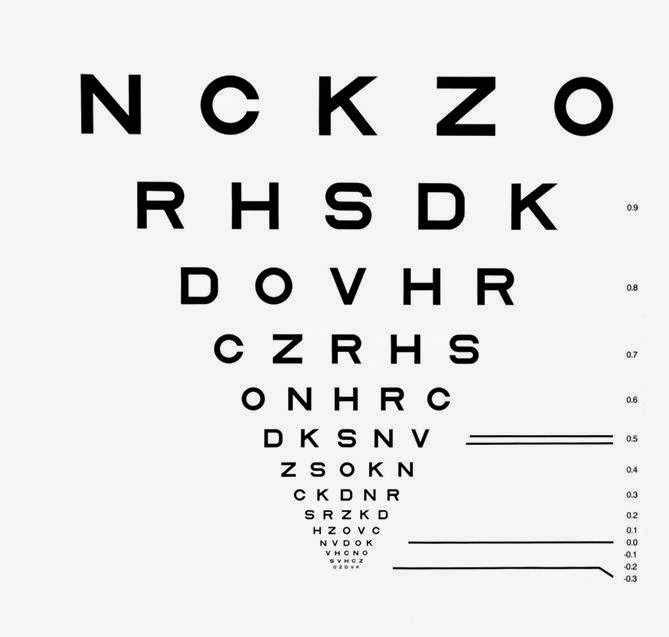 Optometrists will first ask the patient to read one of the charts above, to find out what are the smallest letters that can be read without glasses. For most people with normal vision, letters of 6/6 size are visible/distinguishable at 6 meters. So in a way, one could say that 6/6 means being able to see letters at 6 meters that a normally sighted person would be able to see at the same distance. 20/20 is the equivalent notation in feet. For those interested in mathematical notations, a 6/6 letter on the whole subtends an angle of 5 minutes of arc at the nodal point of the eye. This means that each element of the letter, such as the thickness of the vertical line on a 'D', subtends an angle of 1 minute of arc at the nodal point of the eye. The nodal point refers to the point in the eyeball where the center of an imaginary lens combining all the focusing power of the eye is located. Sometimes, vision is poorer than 6/6, which means that the person could not read the 6/6 line on the chart at 6 meters. In that case, the smallest letters that could be read would be recorded, such as 6/9 or 6/12. 6/9 means that the patient can see at 6 meters, what a person with 'normal vision' would be able to see at 9 meters, and so on for 6/12 and 6/18. The optometrist will then try different lenses to make the patient's vision (with the lenses) 6/6. Generally 6/12 and above vision is considered good vision, and this is the threshold which is considered good enough for driving. Generally speaking, vision worse than 6/12 due to a focusing problem (long/shortsightedness/astigmatism) is an indication that glasses are needed. For most people though, the aim is to achieve 6/6 vision. Having got all of that out of the way, now let's talk about how spectacle power is written down. Pure long sight or short sight is corrected by lenses called 'spheres', or spherical lenses. Longsightedness is corrected by convex lenses, which we will give a plus ('+') sign to, while shortsightedness is corrected by concave lenses, which we will give a minus ('-') sign to. 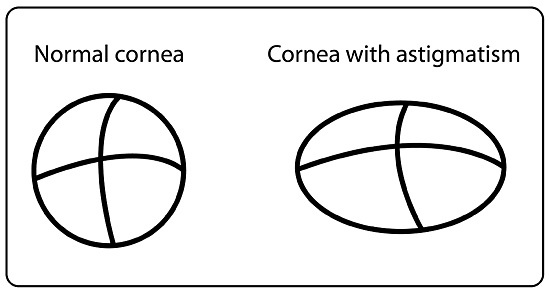 An eye with astigmatism has focusing areas (cornea/lens) which are more curved in one direction than the other (see above). This is like the cylinder (below), which is curved in one direction and completely flat in the other direction. 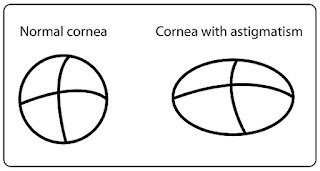 In order to correct astigmatism, a lens which is more curved in one direction than the other (called also a cylinder) is placed so that its curved direction is in the same position as the eyes' flat direction (and vice versa), so the lens' astigmatism cancels out the eyes' astigmatism! Astigmatism is corrected by lenses called 'cylinders', or cylindrical lenses. This can be denoted with either plus or minus cylinders depending on where in the world you are. In places like Singapore, the cylinders tend to go with a minus sign. means 4 dioptres of shortsightedness with -1.50 dioptres of cylinder at an axis of 180 degrees (the long axis of the spectacle cylinder is placed horizontally). Colloquially, 1 dioptre of spectacle power is called 100 degrees in Singapore and some other parts of the world. So the above example would mean a patient with 400 degrees of shortsightedness and 150 degrees of astigmatism. Let's say if you asked somebody to read the chart, and they could only read to the 6/18 line. As a rough rule of thumb, if he/she is shortsighted, then this person is likely to have about 100 degrees of shortsightedness. The 6/36 line corresponds with about 200 degrees of shortsightedness. And anything above that means vision is limited to only the largest letter (6/60) or just counting fingers. I mentioned earlier that 6/12 and better vision is generally considered good vision. Following from this, most people with unaided (without spectacles) vision of worse than 6/12 (ie~6/18) would benefit from glasses. And as a rough rule of thumb that would be somebody who is about 100 degrees shortsighted. That is my general threshold for starting a child with childhood myopia on glasses. Of course, the decision whether to start wearing glasses also depends on how the child's activities are being affected by their vision, so if for example, the myopia is only 50 degrees but the child is sitting at the back of the classroom and cannot see the teacher's writing on the white board, then glasses may already be necessary even for this small amount of shortsightedness. People with 6/12, 6/9, 6/7.5 and 6/6 vision are generally considered to have good vision. Spectacle power can be of the plus sign or minus sign for long and short sight respectively. The numbers for spectacle power indicate the power of the lens required for good vision, ie the higher the number, the higher the degree (the worse) of the long / short sight or astigmatism. For shortsightedness, a general rule for children is to consider starting glasses wear when the spectacle power is 100 degrees and above. In a future post I will review the methods people have tried to either prevent or delay the onset of shortsightedness, which is a problem of epidemic proportions in many cities around the world. One thing which I also want to add in my knowledge box that What People mean by, when in any Advertisement they ask applicants that Vision should be 6/6 or 6/12 with or without Glass. I mean with Glass, everyone will have obviously a good vision, i mean only for good vision people are using Glasses. I mean, this is a doubt, please respond on this. Actually, not every person will have good vision with glasses. If, even with glasses, vision is bad, then that means there is something wrong with the eyeball, or optic nerve, or the visual processing part of the brain. For example, a person may have a corneal scar from an infection which blocks his vision. As such, vision even with glasses can be very poor. If you see a job advertisement and they say that applicants' vision should be 6/6 or 6/12 with or without glasses, it means they don't mind if you wear glasses (ie they don't mind if you are longsighted/shortsighted/have astigmatism), but if you wear glasses, your vision must be good while wearing them. Or in other words, you must not have any other eye disease affecting vision apart from the longsightedness/shortsightedness/astigmatism that can be corrected with glasses. I know it is a bit confusing and do let me know if you need further clarification. -5.75 is spectacle degree in diopters, and the '6/ chart' or otherwise known as a snellen/vision chart just denotes how well you can read the letters at 6 meters. They are talking about different things. But generally any power above about -2.00 means you can only see about 6/120 or counting fingers thereabouts at 6 meters, without glasses. Hope this helps. What does "SPH+0.50,CYL-4.25,Axis 5* in the Right eye and "SPH-0.75,CYL-2.25,Axis 10* in the left eye means? i don't know what all these means and i want to know the power of my eyes!! so please tell me..
Hi Antonio, what it means is explained above under 'Spectacle Power Notation'. Let me know what exactly you don't understand and I will address that. But it is all explained above. my eyes are 75° and 250° what does that mean? Hi, informally people refer to spectacle power in degrees, so 75 degrees is 0.75D and 250 degrees is 2.50D. That does not say whether it is long sight or short sight though. For shortsighted powers, we will usually put a minus '-' sign in front of the power andforlong sighted powers we will put a plus '+' sign in front of the number. I habve a vision of 6/6 & 6/18, is it similar to -5.5? Hi, vision as denoted with the Snellen notation (6/6, etc) cannot be compared with the dioptric value (spectacle power), they are referring to different things. Hie, my friend was told that her sight is -9.00 6/36, how to interpret this to give type or number of eye glasses? Hi, if these numbers are referring to the same eye, I think it probably means that when you put a -9.00D lens in front of the eye, it only sees the 6/36 letter ie the second largest letter on the chart. This means that vision in the eye is not good, and if your friend has not already done so, he/she should go for a full eye check up with an eye doctor to see why the eye is only seeing so poorly despite having the lens on. In other words, eye glasses may not help the vision much at all, and there could be some other eye disease making the vision poor. Thanks for the reply Yong, but what makes me wonder is that she can walk or do house chores without glasses, I wonder why she got that poor vision rating from a doctor. how can I send you a picture of the doctor's prescription? It is a fact that you don't need great vision to do most things in life. Even counting fingers type vision, with a good visual field, will enable a person to walk around without bumping into tables and chairs. Such vision will be enough for sweeping and mopping the floor, washing dishes etc. But it might not be enough for reading fine print, or recognising faces from afar, for example. If you click on the link to my website on the blog profile section, you will find my email address. my contact lens power is -1.75 D, am I meeting the 6/6 eyesight condition if I remove the contact lenses i.e. without contact lenses. Assuming your contact lens power was measured accurately, ie that your myopia is really -1.75D, then without the lenses you would not be able to see the 6/6 line at 6 metres. At 0.5m, yes, your vision would be clear, but at 6m your Snellen acuity (vision on the Snellen test chart) would be around 6/36 or so. Hi, may I know for vision 6/60 what is it translated to degree? Hi Merii, you cannot convert visual acuity like 6/60 to spectacle degree. Thye are two separate things. You test visual acuity by asking a person to read a chart, with or without glasses. The number tells you what is the smallest letter that can be read. Spectacle power is the focal length of the lens used in the pair of spectacles. Having said that, roughly, if a person can only see the 6/60 letter, and if they are shortsighted, they usually have more than 200 degrees of shortsightedness. It is also possible that other kinds of focusing problems like astigmatism contribute to the visual blurring as well. My dad has vision of 6/36. Can it be corrected with glasses so he can read, work on computer etc. Hi there, it all depends on what is causing his vision to be this poor. If the problem is a refractive error (short/long sightedness/astigmatism) then glasses would help. If it is due to say a cataract, then a cataract operation would be needed to restore vision. There are hundreds or thousands of different eye conditions that can affect vision, so your dad has to see an eye doctor to find out what the problem is, and then get the problem treated accordingly. I have nearsighted problem. May i ask is it necessary for me to wear glasses all the time? Even when i am reading close things, cause i can see them perfectly without glasses? Adding glasses, seems to force my eyes to focus even more, which is even more straining. An optician however told me that this would make the eyes lazy and develop problems in future , i.e. causing me to need reading glasses. I disagree because i thought they are 2 issues; one is about the eyeball size and the ability to relax the ciliary muscle; the second one is about the inflexibility of the ciliary muscle. I also heard the saying that glasses are "eye crotches", do you agree? Since it make the yes depends on the glasses instead of learning to relax? Generally speaking, for shortsightedness, glasses are just there to help you to see more clearly. It's up to you whether you wear them all the time, or only some of the time. Whichever you choose will not harm your eyes or make them lazy. If, when you wear your glasses you feel discomfort or strain, they may be over-correcting your shortsightedness or there may be issues with the interpupillary distance-these are issues which need to be sorted out with your optometrist. You might need a second opinion with another optometrist. If you are above 40 years of age, you might feel strain when you wear distance glasses and try to read. This is called 'old sight' or 'presbyopia'. It is due to stiffening and enlargement of the natural crystalline lens of your eye. Nothing makes this process slower or faster-it just happens. If your shortsightedness is not too high, and you are 'presbyopic' (above 40 years of age), you could simply take your glasses off to read. If the degree is high, then getting progressives would probably be more comfortable. If you are less than 40 years of age, then it is probably simpler just to wear the glasses all the time rather than having to put them on and take them off all the time-but it is completely up to you. My son k2 this year, he just got his eyes screening with the result right eyes 6/9.5 and left eyes 6/12P. I hope he doesnt need a glasses righ? Thanks! Just for clarification, I am Dr Por. Thanks for your comment, and have a look at my answer below. 2. On the other hand, it is possible that the eyes have some spectacle power, eg shortsightedness or astigmatism. If so, we should measure it accurately, and only then can we say whether glasses are needed. Why check at a doctor's clinic? For young children, it is advisable to get a 'cyclorefraction', which dilates the pupil and relaxes the muscles of the eye so that the most accurate reading can be obtained. Thanks Dr Por for your advised! As I mentioned above under 'Putting it all together', -2.50D (otherwise known as 250 degrees, which is more than 200 degrees), will usually get you unaided vision worse than 6/36 visual acuity on the Snellen acuity chart. You need to check whether the 6/9 or 6/6 visual requirement allows you to wear glasses or not. If they don't allow you to wear glasses to achieve that kind of vision, then you won't fulfil that requirement. If they allow you to wear glasses, then you might-you have to get that checked out at an optometrist or ophthalmologist's office. As mentioned above, spherical (sph) and cylindrical (cyl) power refer to the spectacle lens power. 6/6, 6/9, 6/12 and so on merely refer to the person's ability to read letters of a certain size on the chart. Spectacle power and visual acuity are 2 different and non-interchangeable things. You cannot convert one to the other and they are not different formats of the same thing. You can guess what the unaided vision (without glasses) would be for a particular spectacle power, but that is not the same as converting from one to the other. Sir..My vision readings are SPH: Right: -3.00 and left :-3.50.Plz tell me the 6/9 format for my readings and am I fit for 6/9 6/9 without glasses test ? Please refer to the answer above your question and the article itself. If there is anything specific there that you don't understand, do let me know. Hi, I need any kind advise. I was informed by the school to bring my 5 year old Son for eye check as he couldn't see. The optician, via the usual eye test machine, told us the results shown is he has 600+degree astigmatism per eye and she told us to bring him to an eye specialist to check his eyes. We got the referral letter from the Polyclinic but the earliest slot is 15Jun 2016. Can you advise if he should see an eye specialist asap? My elder Son was also found to have 300+degree astigmatism per eye when he was 5 years old. And he was diagnosed as having a not "round" cornea which causes him to have astigmatism. Is it possible for young children to have 600 degree of astigmatism per eye at first check? Hi Charmaine, thanks for your comment. 600 degrees of astigmatism is indeed very high. It is very uncommon, but possible. Many young children with this degree of astigmatism have some lazy eye as well, so it is better to get your child assessed and treated earlier. Lazy eye caused by astigmatism gets better with glasses. Your younger son needs a full eye check which would include eyedrops to dilate the pupils and relax the eye muscles. Based on this measurement of eye power, glasses are made if indeed the spectacle power is high. The earlier that you begin treatment for lazy eye, the better and faster it responds. Based on this likelihood, your child would benefit from earlier examination, and possibly an earlier start to wearing glasses, so that any possible lazy eye is treated as early as possible. Hi Doctor Por, many thanks for your advise. They are very helpful to me. I will get his vision accessed soonest. Thank you. Hi Arthe, 6/12 vision is not too bad and if your son is seeing well enough in class he probably does not need glasses just yet. He probably has a low degree of either shortsightedness or astigmatism. To be sure, you will have to bring him to an eye doctor to get the spectacle power and eyes checked out. In one eye, there is -1.50D of shortsightedness, and in the other -1.00D. In both eyes there are -0.50D of astigmatism, in one eye the axis being 30 degrees and in the other 100 degrees. In other words, there is a low degree of shortsightedness in both eyes as well as a bit of astigmatism. Further explanation regarding the notation is all in the article above. sir my right eye's eyesight is 6\12 with glass .can it be done 6\6 by lasik surgery? That depends on whether there is any other underlying eye condition, like amblyopia for example. LASIK only reduces spectacle power, and nothing else. So if there were some other eye condition limiting your vision, that would be unchanged after LASIK, ie the vision may not be 6/6 even after LASIK. I have been prescribed -.50Cyl glasses.Eye Doc said wear it whenever you want to sit long hours on computer.When asked,do I not require to wear it all the time to prevent further deterioration? she said I could do that too.Am confused.Please advice. If your glasses only have a -0.50D cylindrical correction, I would say that is negligible and the glasses are probably unnecessary. But you really need to clarify the situation with your doctor as I have not seen you or examined your eyes, so I do not have a full picture of your eye condition. Yes, you should get your glasses and your eyes checked out, perhaps by a different optometrist or eye doctor. Hi Dr my Four years old daughter having -12 number both eyesight by only checked with refractrometer. Just 3 days ago. We dont feel her eyesight so weak. She just watch tv so close. We are very worry about her. Plz tell can refractometer is 100% correct? Or by brief check by a ophthalmologist have different value. ? And what we have to do that her eyesight come to normal vision? my daughter 8 year old, just has got eye tested (first time) and she has -1.75 and - 1.5, but Optometrist suggested to get lens for -1.25 and -1.0. Is this a good way to do it by having less correction than exact correction? Hi Vijay, this is a bit controversial and different doctors may practice slightly differently. Personally, I tend to prescribe the full refraction, since there is no evidence to show any benefit from undercorrecting the myopia. You might want to ask your optometrist what is the basis for him/her to do so and how they make that decision. If you undercorrect by -0.50D, things beyond about 2-3 meters get a bit blurry, so you have to take your daughter's visual needs into account as well. whether i need to wear class. Could you clarify what you mean by 'whether i need to wear class'? If you are asking whether you need to wear the glasses all the time, then no, you don't have to, but you could if you wanted to. The glasses are just there to help you to see clearer, and that's about it. Whether you wear them or not does not affect the health of your eye, in your particular case. thank you.. it's won't increase the power right ? You may come across different sources saying different things, but in general there is no strong evidence to say that wearing or not wearing glasses influences myopia progression. If you are young eg in your early teens, your myopia is likely to progress to some extent, but that is the nature of the condition. If you are already in your 20s or older, then your myopia will probably remain stable, regardless of whether you wear the glasses or not. And that too, is the nature of the condition. Hi, an autorefractor is not very accurate, especially for young children. If the vision even with glasses is 6/18 and 6/12p, it would be advisable to see an eye doctor soon to recheck the spectacle in case it needs to be changed. If the shortsightedness is going up fast, some people may benefit from an eyedrop called atropine that can slow down the rate at which shortsightedness increases. Hi, the reading is 6/18 and 6/12p without specs. She just went for an eye check up via dilation , 125 and 250 . Prior the dilation, the optometrist did a manual check up and it was 100 and 250 with fluctuation. After dilation, it is 125 and 250. Thought that dilation will normally give a more accurate reading And normally a reduction in The Eye power? But instead this time, it is a constant in one eye and an increase in the other??? I requested for the atophine drop but doc refused, claiming the increase is negligible .. however ,isn't it a concern when the power of 1 eye is constantly increasing n the other is constant ? Hi, as I understand it, 6 months ago the spectacle power was -1.25 and -2.25, and now it is -1.25 and -2.50. That means that in one eye the power went up by -0.25D in 6 months, or perhaps it might increase by -0.50D in one year. It's important to remember that atropine does not reduce the shortsighted power, and only helps to stabilize it or in other words, to slow down its increase. If it is only increasing by -0.25 in 6 months, then using atropine 0.01% would theoretically only slow it down by -0.12D/6 months or -0.25D/1 year, which is negligible. This is why I think your doctor did not think it would be useful to use the eyedrops. But you should clarify with him/her also. Seven years old my son has 6/38 right eye and 6/18 left eye visual acuity. what is the reason for it and can it be correct? Hi, you need to bring your son to see an eye doctor or an optometrist, only then will you know the reason for the poor vision. You also need to know the reason for that before you can talk about correcting it. What is the average degrees reading for short-sightedness at ages 8 and 11 years old? I want to know if my daughter's degree is increasing too rapidly through the years. Hi Joy, average myopia as a figure is hard to pin down as it depends on the population you are looking at. But in my experience I see a lot of children starting to need glasses when they enter primary school at 7 years of age, and for them it is around 100-200 degrees when they start. The concern is whether the myopia increases rapidly. Generally we would consider an increase of 100 degrees or more per year to be fairly rapid, and this kind of increase makes it worth doing something to slow it down like atropine eyedrops. Thanks very much for your very clear reply. I wear a spectacle which has a number of -3.5. So, do i have an eyesight of 6/12 ? 'Spectacle number' and 'eyesight' or visual acuity are 2 different things. If your spectacle power is really -3.5, and you wear your glasses, then your eye sight could be 6/6. ie 6/6 with glasses. Without glasses it would be worse, probably worse than 6/12. If you have some other eye disease, your spectacle power might be -3.5, and your eyesight could be anywhere from 6/6 to blind even with glasses. So you see, they are completely different things and there is only some correlation if there is no other eye disease affecting vision. Hi sir, I'm having a vision 6/36 on my left eye the spectacle power is -27 and blindness in my right eye. Both have no scope of correction as it is by birth. I would like to know the percentage of my eyesight. Eyesight is not mentioned in percentages as such. It is much better and more specific to describe your vision as you have done-ie specify your best corrected vision and the spectacle power to achieve it. Some government agencies or insurance companies may want to specify 'percentages'-if so, these are arbitrary and you would need to ask the specific organisation how they arrive at the figures and how they determine the percentages. These percentage figures have no use clinically ie they are not used in assessing patients and neither are they used in managing patients. My son(5yo) eye test result is 6/15p for both eyes. He had his test at school and he will be referred to Hpb on May. May i know if such vision requires spectacle? Hi, your son needs another check, whether with the HPB or with an eye doctor, before we know whether he needs glasses or not. 6/15 vision is not that good, but checks in school are not always very reliable, and it does not tell you what the spectacle power is. Only after having a refraction test (to measure spectacle power) can you be sure whether glasses are required. Im 30 years of age and I've just been for an eye test today, the optometrist prescribed -0.75 for the right eye and -0.50 for the Left eye. Will it be necessary for me to use spectacles, by using spectacles will it worsen my eyes and by not using will it cause any harm. For your kind of myopia/refractive error, it's up to you whether you wear the glasses or not. If you find distance vision clearer with the glasses, and you need that, go ahead and wear them. If not, then don't wear them. Glasses like these generally don't 'worsen' the eye or refractive error. It's a myth. I try to understand, what does it mean, in fact, when you read it all together? I felt I didn't get a good explanation and I was obviously an annoying customer with too many questions. I thought I was a bit shortsighted but the optometrist suggested multifocal glasses, is that common to wear multifocals when you are shortsighted? Is this the beginning of presbyopia? The optometrist said something like but you are far away from proper presbyopia. Is presbyopia common when you are 35 years old? Possibly in early stage? What are the symptoms of early stage presbyopia? I got the impression that the multifocals were going to help the fact that I have problems changing focus from near to far distance and the opposite (which I haven't thought of before yesterday), does it make sense? Otherwise if only minus I would have to remove the glasses every time I have to watch on near sight. Now I am confused. First, are the progressives thought to be worn all the time? Is that obvious? Is it recommended/common to wear glasses all the time at -1,25/-0,75? In my mind I thought you were kind of "blind" when you wear them all the time? What is the lowest power when people use to wear glasses all the time when being shortsighted? And the focusing problem: could that be sign of false myopia? What is the difference between presbyopia focusing problems and false myopia? How do you know when you have which? And finally: how does the Cyl: -0,25 affect the vision? What is the practical effect of astigmatism compared with shortsightedness? I got to try multifocal contact lenses which didn't include the cyl-value. But the test-glasses did and it was huge difference like in the glasses were much clearer. Does the cyl-value affect that much? Sorry for many questions! But I hope you can help me! Why you went to the optometrist in the first place, and what your main visual problem is. If it was because things far away are not clear, then you could just get distance glasses with the measured spectacle power. If you are 35 years old then multifocal glasses are not necessary, in general. Glasses are just there to help you see more clearly, so you can wear them, or you can take them off, depending on your needs at the time. If you would like to know more about presbyopia and progressives, have a look on my blog posts on these topics. I wouldn't know. Spectacle power and visual acuity are 2 different things, as I pointed out elsewhere...as such they are not interchangeable and you cannot calculate one from the other. If I said my car's engine capacity is 1500cc and asked you what my car's top speed was, you wouldn't be able to tell, either. Le diagnosticaron hipermetropia, segun con el tiempo puede mejorar o empeorar, podria ayudarme con eso por favor, a que se debe, ella solo tiene 13 años, le mandaron a hacer lentes monofocales. I would like to know that i have 6/24 vision and have lazy eye..can i get better vision after wearing glasses? Can i get driving licence? Sorry, I don't quite know what you mean by the first part of your question. I have another blog post on lazy eyes/amblyopia-you will find some useful information there. As for the driving licence, you need to check with your local authority what their requirements are. It will vary with the type of vehicle you want to drive also. i sit on an average 6-8 hours on computer. should i wear glasses or it's normal. Hi, the overall spectacle power is quite low, and I think whether you wear the glasses or not depends partly on whether you feel the extra visual sharpness is worth the slight hassle of wearing them. This is assuming you have no other eye problems or disease. If in doubt, always go back and ask your doctor again. I have not examined your eyes and I do not know details like your age and medical history. Hi, I have another post on lazy eyes (amblyopia), so perhaps you could have a look at that. It will give you a very thorough explanation. Sir, my glasses have -1.25 power. Do I have distant vision of 6/9 without glasses. Hi, I don't know the answer to that. But most likely, the answer is no. hi sir i am 25 years old 2 days ago i got my eye checked and the result is left eye 6/6 & right eye 6/36 so if i didn't wear any contact lens does it become worse and make the normal one make it like the other blurry one? Hi, the question is: why is the vision in your right eye 6/36? Does it improve with glasses or contact lenses? If not, you need to see an eye doctor to check if there is any other eye problem causing the blurred vision. Hi doctor, may I ask a question. I have went to optometrist and checked my eyes. The result shows taht my right eye is -0.75D and my left eye is -0.25D. The optometrist said that I need a glass, but my friend said that I should not wear as it can cause my eye condition worsen. I think my eyes power is not too high, but as a student, its hard to see the words on whiteboard clearly as they appear to be blurred on my vision. Do I need a glass doctor? Well, if it is hard to see the words on the whiteboard, and the glasses help you to see more clearly, then you should wear the glasses. Ask your friend what proof he/she has that wearing glasses cause your eye condition to worsen. There is in fact no evidence that wearing glasses makes myopia worse. Unfortunately, there are many people out there who repeat myths and falsehoods without any real knowledge of the subject matter. The problem with this is that it causes unnecessary worry, and worse, by stopping people from wearing glasses that they need, may affect people's studies or cause accidents by preventing people from seeing clearly on the road. Don't listen to these people-that's my honest advice. My son , 6 yo, was checked with Kkh, with myopia 275 left N 300 right one mth ago. He was prescribed w a new spectacle on the day itself after kkh, but the reading with the new spectacle had only achieved 6/9 for both eyes according to the optician at the optics shop. I thought with the new prescription, the vision should achieve 6/6, isn't it? Is it a concern? Should i review the prescription with the doc asap? If we presume that a full eye check was done, including pupil dilation and cycloplegic refraction, then vision of 6/9 can be monitored in young children if no abnormality was found on the examination. As the child grows older and the visual system matures, their vision often improves spontaneously to 6/6 (with glasses as necessary). If you are still concerned, you might want to consider obtaining a second opinion. Nice blog and thanks for sharing. Get Lazy Eye treatment in India at affordable cost. Visit our clinic and get the perfect solution for eye related issues. Hi dr por, my 10 year old gal was told to have 150 degrees in her right eye but left eye is perfect . Optometrist has advised her to wear glasses though she hasn't complained of blurred vision yet . She was prescribed right eye 75 then progressively up every 3 months . Can you advise if she should start wearing glasses now or wait a while more ?Will it affect her good eye in this case ? Thanks in advance ! Hi, I think the best thing to do is bring your daughter to an eye doctor, to have a 'cycloplegic refraction' done-ie check spectacle power after putting pupil dilating drops. This will relax the focusing muscles and ensure an accurate measurement. If an imbalance in spectacle power is found, spectacles may be necessary, and depending on whether it is longsightedness, shortsightedness or astigmatism the glasses might need to be worn some of the time or all of the time. The best thing to do is to visit a doctor for the check mentioned above and only then will you know what you need to do. Hi - my kid has 6/15P - does she have to use spectacles? Hi, 6/15p vision is not very good. You need to bring you child to see an eye doctor and get a spectacle power measurement done. Remember 6/15 is talking about visual acuity ie the smallest size of letters the child can read on the chart-it does not tell you the spectacle power measurement. Nevertheless, 6/15 suggests that there is significant spectacle power, and so you need to go and get that measured properly at an eye doctor's clinic. Only then will you know for sure whether she needs to wear spectacles or not. Hi Madhu, if your vision is 6/36 you need to see an eye doctor first to see what is the cause for the blurred vision. I am not familiar with eye doctors in India and do not know where in India you are from. If there is a treatable cause found for your poor vision, then you might not need a 'low vision hospital'. Hi Dr Por, my son just did his eye check by HPB at his preschool. The result is 6/7.5P for left eye. What does the "P" actually means? His right eye is 6/9.5. Is his right eye slightly myopic? Hi, 'p' stands for 'parts', ie he could read some of the letters on the 6/7.5 line but not all of them. Vision that is not 6/6 could have a number of causes including myopia or astigmatism or inattention or just lack of visual maturity in very young children. This is not an exhaustive list-there could be any number of other causes. However, generally speaking if vision is better than 6/12 during screening it should be OK ie unlikely to have any serious issues. That would be the aim of screening-to detect significant problems and then refer to a doctor if necessary. Screening tests are not designed to detect or diagnose every eye problem. In other words we cannot tell whether the right eye is myopic or not, just based on the screening vision check. Thank you very much Dr Por... Thanks for your professional advice and reassurance. When doing an eye test, if the alphabet looks hazy but u can still roughly identify the alphabet, should we identify the alphabet or say not clear? I assume this will determine the degree/power of our spectacles. Hi, great questions. As long as you can identify the letters on the Snellen eye chart, you should say them out. You are allowed to guess-that's right, you are supposed to do your best including guessing. When we administer the test, we are well aware of the fact that as the letters get smaller, the more difficult they are to see and the less defined the edges may appear. You can tell the examiner if the letters are not sharp, but you should still guess the blurry letter. There are some tests where choices that are given are meant to have no difference. ie option 1 is supposed to be the same as option 2, rather than one being sharper than the other. This must be communicated clearly by the examiner. An example of such a test is the red/green duochrome test. The end point is when both red and green are about the same, rather than when red is clearer than green or vice versa. When small changes in power are given eg 0.25D, it can also be difficult to tell the difference, but that would be taken into account by the examiner. At the end of the day, the important thing is for the examiner to explain clearly what they require from you. If you are unsure, please do ask and clarify with the examiner at the time of the examination itself. Do you think they need wear glasses? Sir my Lens power is -2.5D in both eyes. Can I see clearly the vision acuity of 6/12;6/9 with wearing the glasses?